Coyote C145 walks near a construction site in the Silver Lake neighborhood near downtown Los Angeles late Wednesday evening June 3rd, 2015. 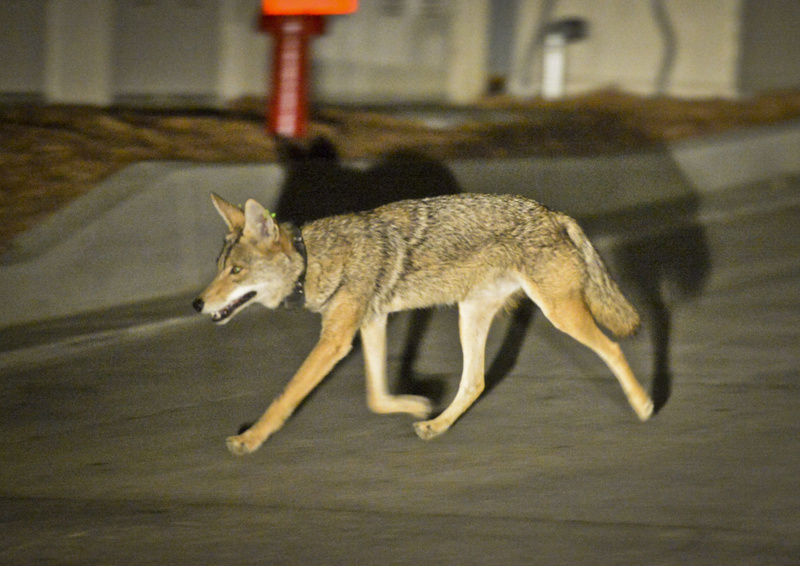 The National Park Service's urban coyote study is one of the few looking at urban coyote behavior in Southern California. Donna Perez was stooped over in her backyard, fixing a sprinkler, when she heard her dog start shrieking. She stood up and whirled around, but it was too late. A coyote had jumped over the yard's five-foot wall, snatched one of her two pet Yorkies, and disappeared. "We did not find her until the next day, and she was 95 percent dead," said the Arcadia resident. The dog later died. Soon after, Perez went to the Arcadia city council along with five other worried residents. They told stories of being stalked while walking their dogs, of coyotes trapping them in their cars, and of the pepper spray and golf clubs they now carried when they left their homes. "There is a new breed of coyote in the neighborhood," Perez told the council. They are smart and cunning, they are bold and fearless." 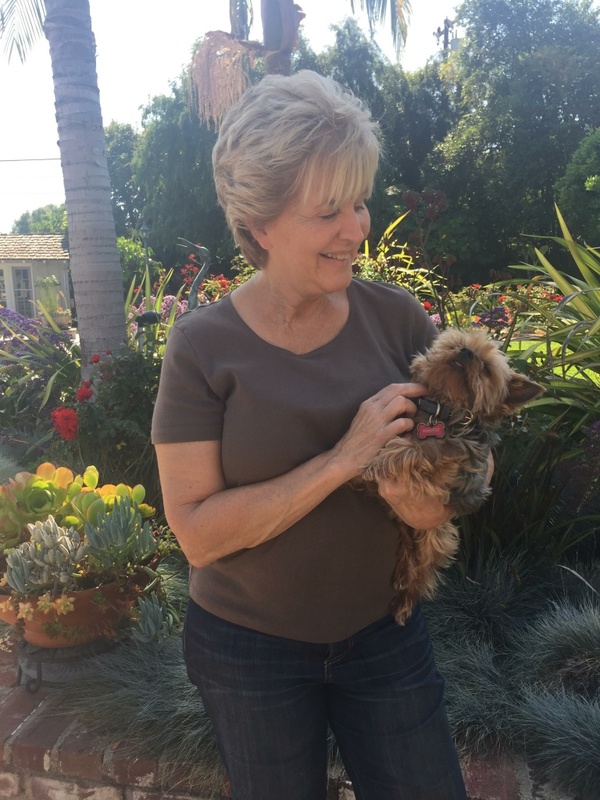 Donna Perez with her pet Yorkie, Cody. Her other dog was killed by a coyote in her backyard last fall. Over the past two years, aggressive coyotes have attacked pets or bitten people in a number of cities throughout the region, including Glendora, Montebello, Irvine and Los Angeles. And Southern Californians have been filing complaints about coyotes for decades. But there's a problem with Perez' conclusion that the region is being stalked by a more dangerous type of coyote: There's no science to back it up. There has been very little research on coyote-human conflicts in urban areas, so experts don't have a handle on what causes these interactions, how often they occur or how to prevent them. And that makes it difficult for cities to know how to respond. So the approach they often has more to do with emotion than science. In Arcadia, City Manager Dominic Lazzaretto recommends educating residents about how to live with coyotes. "We haven’t really focused on things we can do to make the coyotes uncomfortable in our neighborhoods," he said, "to make the coyotes perceive humans as threats once again and go back into the hills where they belong." But Councilman Roger Chandler favors something more aggressive: trapping the animals and killing them. That wouldn't be cruel, because "if we were in Wisconsin on a farm we’d be shooting them with .22s," he said. Trapping coyotes is legal in California, but by law they can’t be relocated; they have to be killed. Arcadia tried trapping once already, back in 2010 and 2011. Many people in town say it worked, that they didn’t see many coyotes afterwards. But the city stopped trapping, and now city hall gets three to five coyote complaints a week. "We’ve always had problems with coyotes but I sense there’s a bigger problem now than we’ve ever had before," said Councilman Tom Beck. This is hard to prove. Like most cities in Southern California, Arcadia doesn’t have long-term data about coyote complaints. "The data is an absolute mess," said Niamh Quinn, a coyote researcher with UC Cooperative Extension in Irvine, who recently authored a study on coyote conflict trends in Southern California that's currently undergoing peer-review. 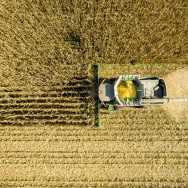 Even among the cities, county and state agencies that do track complaints or coyote bites, there is little standardization in the collection of information, making it very hard to look for trends. It’s why Quinn created an app to track coyote complaints that she hopes most Southern California cities will adopt. 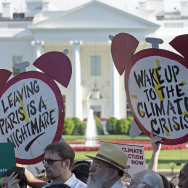 "From a scientific point of view, if you’re not asking the same questions, you can’t really analyze it," said Quinn. Still, one of the few reliable sets of data in the area suggests the problem may be getting worse. The L.A. County Department of Public Health tracks the number of county residents receiving rabies shots for coyote bites. 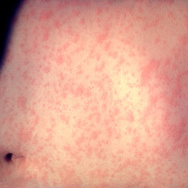 In 2012, just three people got the shots. That jumped to 16 last year. In 2015, 12 people were bitten by coyotes in Elysian Park in Los Angeles in the space of five months, according to Public Health. In one incident, a person was bitten while trying to stop a coyote from attacking a dog. But in many other cases the coyote approached humans directly. People were bitten while stargazing, lying on the ground or jogging. Kids were bitten while playing in a playground. "Prior to that, we’d rarely see attacks of people," said Karen Ehnert, the chief veterinarian for Public Health. "Now we’ve been hearing about them in different circumstance where it’s totally unprovoked. I mean, that’s just not normal behavior for wild animals; they should be afraid of people." Scientists don’t know why coyotes lose their fear of people. But there are a few theories. One is that because urban coyotes constantly see people and we don’t frighten them away or try to hurt them, they slowly get used to us. Over time, that can lead to the animals becoming aggressive. Many coyote management policies include an aggression scale that begins with seeing coyotes on the street, and ends with coyotes harassing or even biting people. But there is fierce disagreement about when to kill coyotes, if ever. The University of California's Statewide Integrated Pest Management Program recommends killing coyotes when they become aggressive, specifically when they begin killing pets in daytime. The Humane Society of the United States, meanwhile, only recommends lethal control in the event of an unprovoked attack on a human. 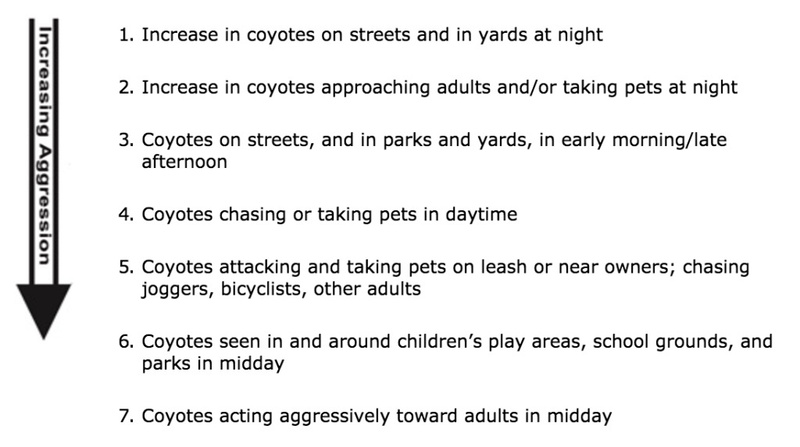 The University of California's Statewide Integrated Pest Management Program's coyote aggression scale. But according to multiple scientists interviewed for this story, there is no scientific consensus on when to kill a coyote or on how effective trapping is. That didn't stop Arcadia from voting to spend $15,000 on a trapping contract. "I want to do whatever we can to help the residents, make them feel safe," said Councilman Beck. "Nobody should have to worry about going to their mailbox or getting in their car. We shouldn't have to feel that way." After choosing to move ahead with trapping, Arcadia got pushback from animal rights activists, led by People for the Ethical Treatment of Animals, or PETA. They staged a silent protest outside of city hall, holding signs of bloodied coyotes caught in snares, and they packed the next city council meeting. Arcadia residents Jean Jerose and Maria Christina Halstead were among the 80 or so PETA supporters urging the council to reverse course. "Please do not let this happen," Jerose said. "The fear is not real and it’s based on a lack of knowledge, as almost all fears are." Added Halstead, "the trapping and killing of these animals is an irresponsible and inhumane response to a problem that has other solutions." PETA argues that people need to change their behavior to avoid conflicts with coyotes. It suggests steps to make the human environment unwelcoming to coyotes, such as cleaning up garbage, not leaving pet food out, keeping pets on leash and yelling or blowing whistles at bold coyotes, an action called "hazing." However, there is no research to support this approach. 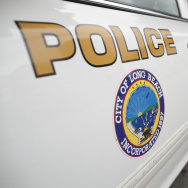 KPCC asked PETA for evidence that hazing works to reverse aggressive behavior, but the organization couldn’t provide any, instead saying it works best as part of a suite of non-lethal solutions. National Park Service researchers based in the Santa Monica Mountains who are running one of the few urban coyote studies in greater Los Angeles say there is anecdotal evidence that hazing works on coyotes that aren’t accustomed to people yet. But once they get used to humans, it may be too late. At that point, according to Seth Riley, a Park Service wildlife ecologist, there’s not much else that can be done besides trapping and euthanizing. But even then, it’s hard to be sure you’ve killed the problem coyote. The only surefire way to know is to swab a bitten person's wound for coyote DNA and see if it matches that of a snared coyote. If a coyote is trapped in response to a pet attack, however, there’s no way to ensure the aggressive coyote is being killed. In that case, Riley said, animal control companies may trap coyotes until the problem goes away. Scientists say this level of uncertainty is commonplace in urban coyote management, given the almost complete lack of research on what works, on whether conflicts are getting worse, and even on what constitutes a conflict. So cities find themselves confronted with the question: Is it more important to avoid harming coyotes at all costs, or protect people and their pets? In Arcadia, the city council voted to protect people and pets. But then PETA sued the city in March. To get out of the lawsuit, Arcadia announced last month it wouldn’t trap after all. PETA claimed victory, but resident Donna Perez felt differently. "It feels very unsafe," she said, adding that she feels "very let down .. very alone." Arcadia is now working on a comprehensive coyote management plan which will likely include education and, possibly, trapping. Does trapping and killing coyotes actually work? What do LA's urban coyotes eat?